Crete is commonly referred to by critics as the best Greek island for foodies and this is absolutely the case! With the longest growing season in Greece, fresh fruit and vegetables are in abundance as well as the highest quality of olive oil. Many visitors to Crete have commented that the air is heavily scented with the wonderful smell of wild herbs which grow throughout the island – particularly thyme and oregano. Local tavernas produce a smorgasbord of glorious home cooked Cretan dishes using the freshest of these herbs and the finest of oils as a starting point for many mouth watering dishes. However, surely one of the greatest luxuries of taking a villa in Crete is the freedom to experiment with the natural produce of the island in your very own kitchen (or BBQ!) Read on to discover where the best places are to source the finest of ingredients! Perhaps the best way to begin your culinary adventure in Crete is by visiting the excellent covered market in Chania – a great landmark of the City known as the Agora. Here you will find a great selection of fresh fish – something which isn’t that easy to find in Crete, especially at a good price. You will also be able to select some very good herbs with which to season your meats as well as fine olive oil. The market is best visited in the early morning to avoid the crowds, especially during the summer. 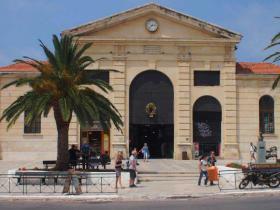 It is open Monday to Saturday from 8.00 to 13.30 or 14.00 and Tuesday, Thursday and Friday evening from 17.00 to 00.00. A stroll through one of Chania’s weekly street markets will offer the opportunity to purchase a great variety of fresh fruit and vegetables (expect some weird and wonderful shapes rather than the standard sizes we are used to at home!) As well as some excellent value fresh local produce and meats, you will also encounter live chickens and rabbits along the way and even the odd clothes stall! The most popular of the street markets is on a Saturday in Chania in Odos Minoos, near the eastern fortification wall. There is a good variety of big supermarkets in and around Chania which will allow you to stock up on many of the essentials for a week or two of self catering - including charcoal for the BBQ if needed! Smaller resorts such as Almirida, Kalives and Georgioupolis have rather more specialist shops such as a local baker and butcher, but the supermarkets here are nowhere near as big or well stocked as those to be found in Chania. Gathering supplies for your breakfast, lunch or evening meals at the villa can be a great way to see more of the island! Why not journey to Chania each week to experience the vibrancy of the markets and along the way stock up on local honeys, herbs and cheeses as you journey through traditional Cretan villages! You will soon be an expert on the local produce... bliss! Crete has around 60 olive trees per inhabitant so olive oil is one of the staple foods. A good restaurant will place great importance on using the finest of olive oil as it is such a vital part of cooking. Be sure to bring some extra virgin oil home with you (an excellent gift!) and if possible buy from a local supplier to ensure the finest quality at an excellent price. Graviera: the name is a loose rendition of the word "gruyere" and it is a little similar. This is the standard hard cheese and being of local production, there are many types and tastes. Taste before buying. Myzithra: a fresh cheese made of ewe's milk. It can also be made of goats milk (in which case it is called "katsikithia") or mixed milk. This is the standard fresh cheese. A good goat's one will taste like these expensive French "chèvre frais" that you can buy in good delis, at a fraction of the price. Anthotiros: from the words "anthos" and "tiros" meaning "flower" and "cheese" it is a very mild, soft spring cheese made when the sheep pastures are still full of flowers. 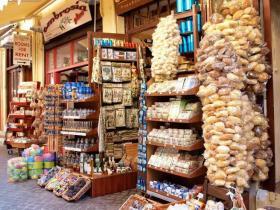 The Cretan honey is especially good and can be found in all of the standard shops. Crete has been a prominent honey producer for many thousands of years and is famous for the quality of its product. Be sure to try the thyme honey during your holiday and visit a local producer for the finest quality at the best price. An interesting and perhaps surprising fact is that tap water is drinkable everywhere in Crete. There is no compulsion to order bottle water with your meal – simply request tap water in a carafe to reduce the cost of your bill even further! When ordering Greek coffee you may indicate how sweet you would like it to be using the following terms. Sketo means without sugar, metrio is medium sweet and glyko is very sweet. You will also find trendier bars and cafes serving espresso, filter coffee and cappuccino should you require a little more home comfort! Raki or tsikoudia is the local “hard drink” but beware – it is pure alcohol and can get you rather squiffy very quickly! Distilled from what is left over from pressing grapes, it is pretty strong stuff and usual served in small glasses as an aperitif at the end of a meal. It is a little difficult to buy because it is mainly home-produced. The bottled liquid called 'raki' or Cretan raki" in the supermarkets is not good and no Cretan would touch it! Traditionally there is no such thing as red or white wine in Crete. The wine is a golden brown colour, more like sherry, with a fairly high alcohol content (13 - 14%). Whether you like it or not is very much a matter of taste and of course a matter of where you drink it. It is cheap and you may be able to buy it by the litre in your local shops or café. Taste before buying because it can be very good or very bad. Retsina is a Greek white (or rose) resinated wine with a unique flavour and an acquired taste. 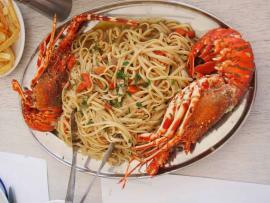 So as you can see, Crete really is a food lovers paradise with new tastes and experiences around every corner. If you are yet to book your holiday for 2017 then take a look at our stunning villas in Crete and perhaps you will find yourself perusing the markets in Chania before the year is out! Whichever month you choose to visit Crete you will be enchanted by the beauty of the island and the friendliness of the locals. Prepare yourself to fall in love with the culture, beaches, sunsets and of course – the mouth watering Cretan food. Yamas!